Throughout California history, the total surplus of Municipal Solid Waste has waxed and waned. As residents, our refuse has grown by around 20% in the last 10 years. In an effort to combat this ever-increasing problem, the city of San Francisco made an ambitious promise to go “zero waste” by the year 2020. 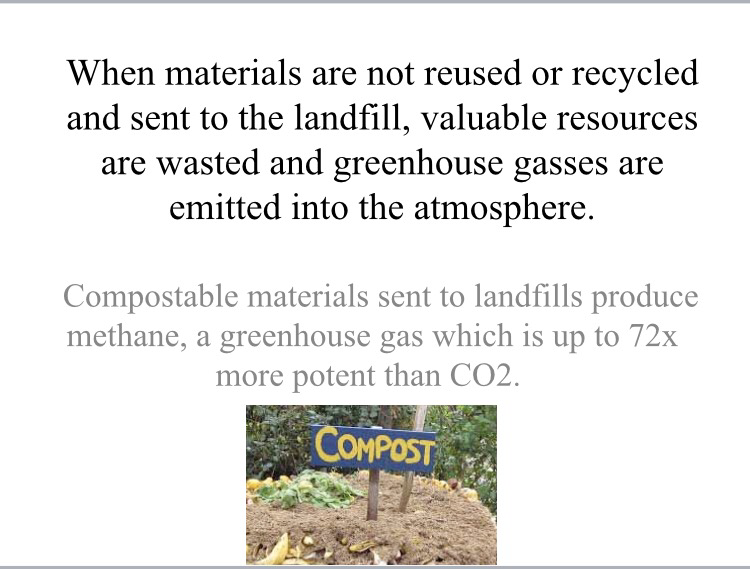 Zero waste is the concept that all discarded items are either composted or recycled; nothing goes to landfill. With increases in residential waste trends in the last 10 years,1 a change was imperative, but shopping from stores that sell sustainable or organic products is often costly. 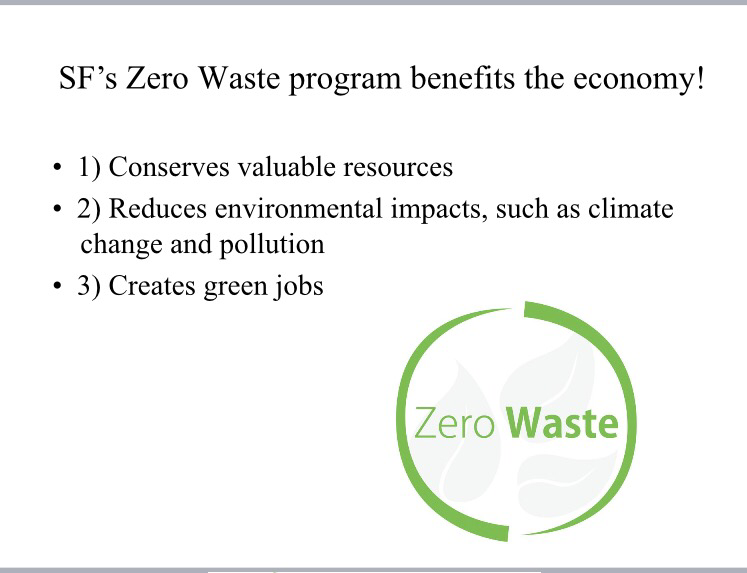 Despite the common perception that zero waste is difficult to achieve or unaffordable, it is possible for a low-income college student to produce close to zero waste while still being able to feed herself and boyfriend and still live comfortably. Statewide trends over time show that although (the number of tons of) franchised commercial waste has reduced from 50% of all California waste to 39% from 2008 to 2014, the amount of franchised commercial waste rose significantly from 30% to 47% of all waste in that same period.1 Viewed alternatively, residential per capita disposal (tons per resident per year) rose from 0.32 to 0.38 from 2008 to 20141. Locally, the “Bay Area” (Alameda, Contra Costa, Marin, Napa, San Francisco, San Mateo, Santa Clara, Solano, Sonoma) accounted for about 15% of all CA waste in 2014, or about 4.63 million tons from a statewide total of approximately 30.8 million tons.1 Of the 4.6 million tons of MSW generated in the Bay area, about 40.9% (1.89 million tons) was franchised residential.1 According to these figures, the Bay Area is doing a slightly better (6%) with regard to residential waste in comparison to statewide numbers. In the Bay Area, as well as around the country, a large portion of our solid waste is food-related waste. Food-related waste is the foodstuff itself and the materials used to package and distribute it to the consumer. This can include but is not limited to cardboard boxes, paper and metal twist ties, or the green plastic bags used for hold your produce. 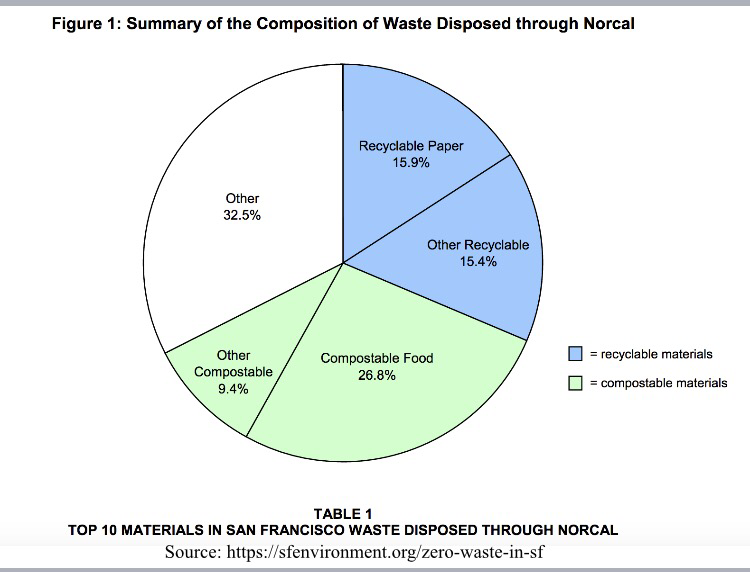 According to waste characterization studies commissioned by the city of San Francisco, 36.2 %of waste disposed through Norcal Inc. was compostable matter, which consists of foods, paper towels, lawn trimmings, and other items that used to fill my trashcan. I chose to focus on food-related waste because it is one that can be impacted directly by shopping more consciously and saying no to unrecyclable items. It was on the notion of sustainable living where the Zero-Waste Lifestyle was born. 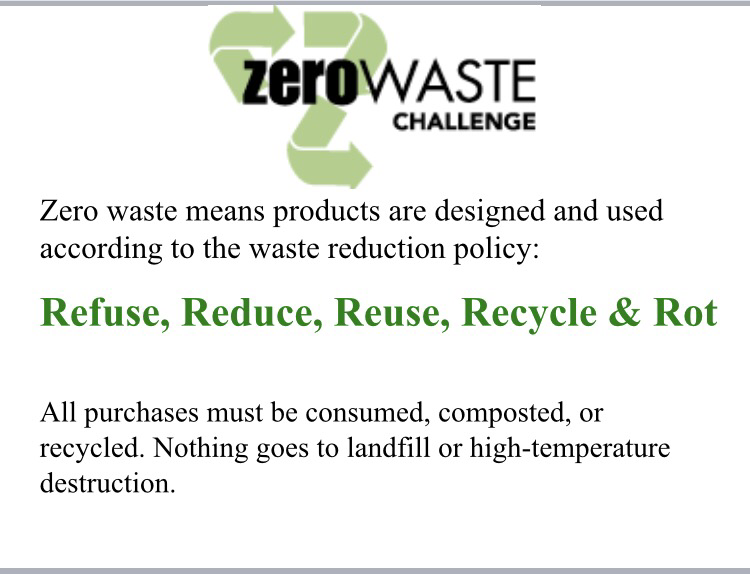 Zero Waste is what it says, producing as close to no waste as you are possibly able to. Under the best circumstances, all your items get consumed and nothing gets wasted, the next tier is to compost all the foods and compostable items you are able to. If your waste cannot be composted, the next step, though still frowned upon, is to recycle. As recycling is still very inefficient, is often processed offshore, and still requires energy and water to achieve. Trashing items to be landfilled is the very last resort in the zero waste lifestyle, and true zero-wasters pride themselves on the less than liter amount of trash they produce annually. With a city-wide goal of zero waste in less than three years, drastic changes must be made, and those changes need to start with the individual. According to The San Francisco Chronicle, our façade of environmental sustainability is only skin deep, “San Franciscans create more trash every day than they do recycling and composted material together. Those clock in at about 600 tons and 650 tons a day, respectively” (Knight, 2016). In other words, it is critical that 100% of our residents make every effort possible to eliminate their need to produce landfilled waste if we are to achieve our goal. Education is key to implement and spread the ideas and concepts of waste free living and the environmental and financial benefits that go along with it. 2014 Disposal-Facility-Based Characterization of Solid Waste in California. Rep. California Department of Resources Recycling and Recovery / Cascadia Consulting Group , 6 Oct. 2015. Web. Apr. 2017. .
 State of Disposal in California . Rep. no. DRRR 2015-1524 . DEPARTMENT OF RESOURCES RECYCLING AND RECOVERY , Mar. 2015. Web. 27 Apr. 2017. . WASTE CHARACTERIZATION STUDY . Rep. City and County of San Francisco Department of the Environment , Mar. 2006. Web. Apr. 2019. .
 Knight, Heather. “SF Not as Green as it Thinks.” The San Francisco Chronicle [San Francisco] 18 Sept. 2016: n. pag. Web. 26 Mar. 2017.